An account of the riots at the popular West London carnival which were sparked by the arbitrary harassment and arrests of young black attendees by police. 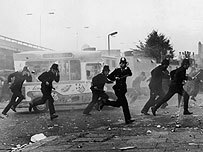 Taken together with similar anti-police riots such as those in Broadwater Farm and Brixton in 1981 they forced a dramatic change in policing methods in the the capital. Every year, during the August bank-holiday, Britain's West Indian community holds a Carribean-style carnival, with colourful parades, music, dancing and dozens of side events. Hundreds of thousands of people from all over the country attend. It is held on the streets of North Kensington. In 1976, however, the festivities were interrupted on the last day. Young blacks harrassed by a police presence numbering 1,600 defended themselves against arbitrary police arrests. At about 5pm rioting broke out, it spread over the whole Ladbroke Grove area and lasted well into the night. Over 300 police were injured, 35 police vehicles were damaged, several shops looted and 60 people arrested. This is an attempt to sort out the reports in the media. The large police presence was 'justified' by shady allegations of mass outbreaks of petty crime by young blacks in the crowds. But this was no excuse for the massive police presence. The young blacks, people with good memories, knew that the police were there for the express purpose of terrorising them. Mass arrests of young blacks (and of course still is) is so commonplace, the police so hated, that the police force of the entire country had only a couple of dozen black police officers. Cases involving mass arrests in London alone- the Mangrove 9, Metro 4, Oval 4, Brockwell Park 3, Swan Disco 7, Cricklewood 12, Stockwell 10; cases that have involved frame ups and police brutality, are examples of the extreme harrassment suffered by young blacks. Individual cases, random street searches and beatings by the police must have run into tens of thousands. It is not a question of how many police should have been there, that is a question for liberals to pick bones over, the question is: Should the police have been there at all? Only the people who attended the carnival can answer that. Anyone who attended the event must have been offended by the sea of police helmets and uniforms, it was after all a carnival not a political demonstration. Let us now look at the fighting battles. The actual riots were the fiercest and most protracted street battles on mainland Britain since the 1936 Cable Street riots. Who won? From newspaper reports it looked as though the police took a real hammering. The battles that raged that day were not like the usual police vs left confrontations, more like the Falls Road battles of the early 70's. Police were knocked over like ninepins by volleys of bricks and bottles (the nearby demolition sites providing ample ammunition). Baton charges were ineffective in dampening the enthusiasm of the rioters as they paid the police back for years of harrassment. Although attempts to build barricades were ineffective, the sheer hostility and mobility of the rioters along with the constant stone throwing drove the police back. The police having no riot equipment such as shields, had to pick up dustbin lids and traffic signs to protect themselves, police also tried charging the crowds with their vehicles, horns blaring, but the intense stoning forced the police to abandon some of them, which were set on fire and several were burnt out. The initiative lay with the youngsters until midnight, when the rioting petered out. In the aftermath of the riots it was learnt that several shops had been looted, but this was a mere fnnge activity, involving as many whites as blacks Most of the people there were either trying to get away from the riot area or fighting the police. The stalls under the Portobello flyover were not looted, they were smashed up and used as ammunition. It is interesting to note the large number of hated transport police that were injured and that a number of their vehicles were burnt out. (The transport police have been involved in beating up young blacks and framing them especially in South London). The crack Special Patrol Group seemed to inflict most of the casualties on the crowd, mostly randomly, thus helping to spread the rioting, but the ordinary police were hard put to control the situation. Bridges over the Thames were blocked by the police and cars containing young blacks were turned back; but it was too late, blacks from all over London, indeed from all over the country, were at Notting Hill already. The Notting Hill riots were a collective reply by the young black community to years of police repression. They were not race riots but anti-police riots by (mostly) unemployed, low-paid, young blacks, the people at the bottom of the economic and social scrapheap. Two weeks later in Birmingham 300 young West Indians gathered in the town centre after a youngster was arrested for stealng an ash-tray; a few days later 50 youngsters stoned police outside their station after people had been arrested, not dispersing until early morning. It seems that this is going to become a more common occurance, probably spreading to other discontented sections of the population. Notting Hill was only the beginning.